How anti-guestworker activists are causing more imported food, harm to consumers - PROTECT FARMWORKERS NOW! With it, more pesticides and illnesses. those fighting against guest workers are making this worse. This report dates to 2012 and 2013, so much of the information is out of date. For example, it reports that 25% of our fruit is imported. That was true of 2012, but just six years later, the New York Times reported that over 53% of our fruit is imported. More than double in six years. But the problem this report identifies of labor shortage, combined with rising labor and other farm costs, are behind much of this change. While union activists in Whatcom County continue to call the worker shortage a "myth" and work hard to increase the shortage by eliminating the guest worker program, we are beginning to lose our farms because of this problem. Trade inequities and labor costs combine to make it more and more difficult for Western Washington red raspberry growers to survive. What is happening to them may very well happen to other types of farmers as well. That's up from 12% in the 1990s. The problem is that with that increase comes an increase in food borne illnesses. According to the Center for Disease Control (CDC), "the number of outbreaks associated with an imported food increased from an average of 3 per year during 1996-2000 to an average of 18 per year during 2009–2014." Another issue is pesticide residue. The Food and Drug Administration reports that imported food is five times more likely to have pesticide residue above violation level than domestic food. Farmers are struggling to find the workers needed to harvest crops and do other farm work. The number of undocumented immigrants has declined significantly since 2009 causing a severe shortage of farm workers. Washington farmers pay workers about $20 per hour with many earning more because of incentive pay. This is over 20 times more than most of their foreign competitors. Mexican minimum wage is $11 per day with other countries paying even less. Guest workers are also provided transportation and housing that must meet federal standards. Numerous labor laws protect farm workers – likely more than any other worker. These add about $1200 in costs per worker for a season. Washington farmers hired 18,000 guest workers, mostly from Mexico, during the 2017 season. Before being allowed to bring these workers in with legal visas, the farms had to prove they had exhausted all efforts to hire domestic workers. Union organizers, like Community to Community, fight against guest workers thinking the severe worker shortage provides opportunity to impose unions. In doing so, they harm workers who value these jobs. Washington guest workers returned $288 million to their families in Mexico in 2017 alone. Taking these jobs takes food off the table of those who very much need it. To stop guest workers, the activists attack farmers who hire them with vicious false accusations, file lawsuits and boycott major brands using the farms' products. 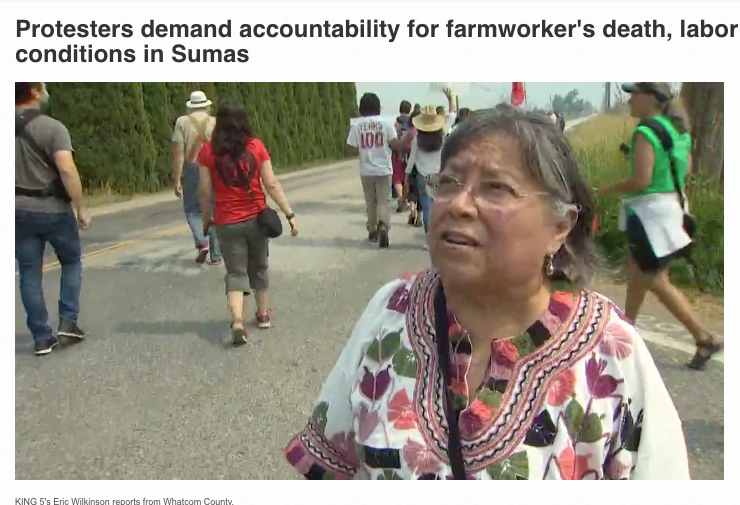 They continue to insist a Sumas berry farm caused the death of a worker in 2017 when in-depth investigation by Labor & Industries and the Medical Examiner declared he died of natural causes unrelated to any working conditions. Farmworkers need your help to keep these high value jobs. Learn about the guest worker program, also called "H2A" for the legal visa these workers receive. Helping our family farmers secure the workers needed to produce our local, domestic food is in everyone's best interests. Please consider joining our effort.